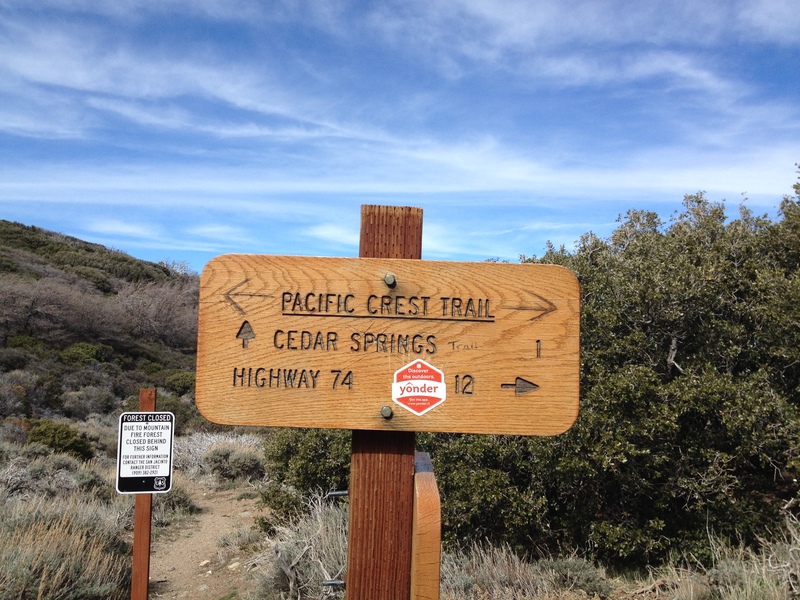 In our opinion, the best time to hike here is during wildflower blooms in the spring. However, a winter day hike provides mild temps and relatively stable weather. Winter is the rainy season is southern California, so you have to keep an eye out on the forecast to avoid dangerous flash flood conditions. 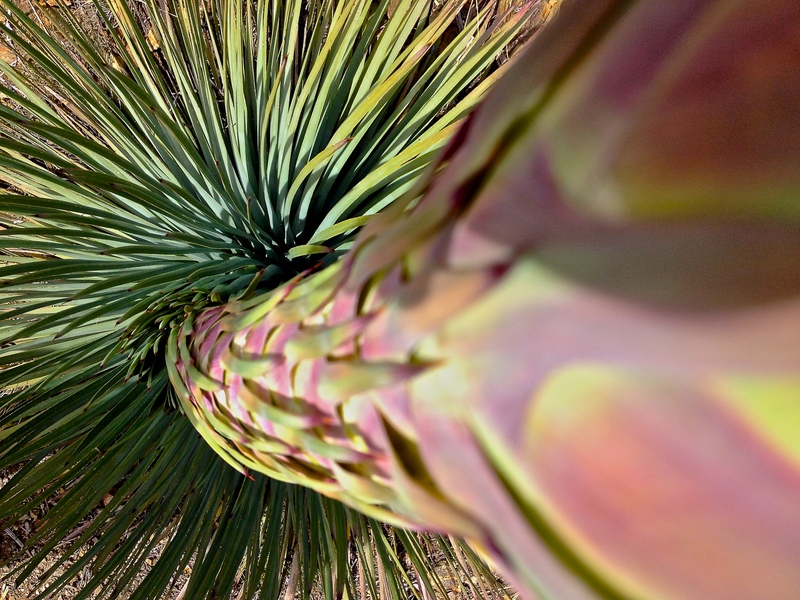 If you ever have the opportunity to hike near the palm oasis at the state park headquarters, you will see the results of a previous flash flood. Palms over 4 feet wide were uprooted and washed away, boulders the size of cars were rolled around and thoughts of the great flood mentioned in the book of Genesis came to mind. 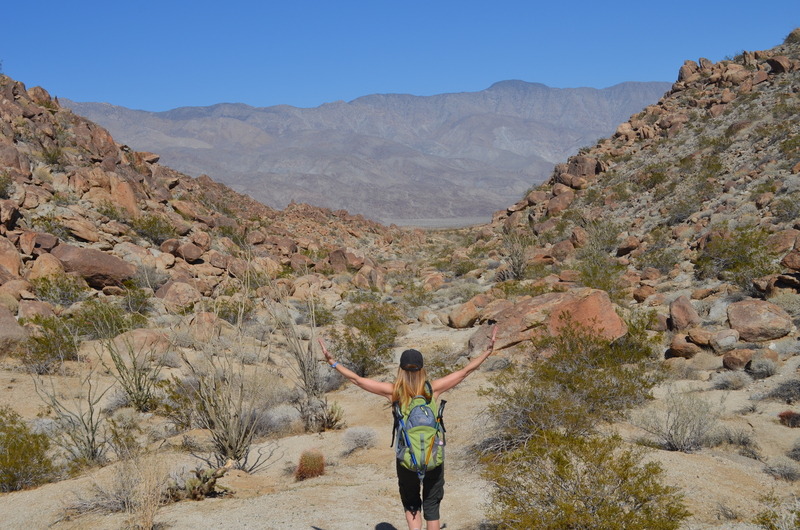 On this day, we would venture out approximately 20 miles east of the town of Borrego Springs on SR-22 to hike the Calcite Mine Trail. We parked on the north side of SR-22 and walked to the trailhead that was about 100 yds. away. You can actually park most vehicles in a dirt area by the trailhead. 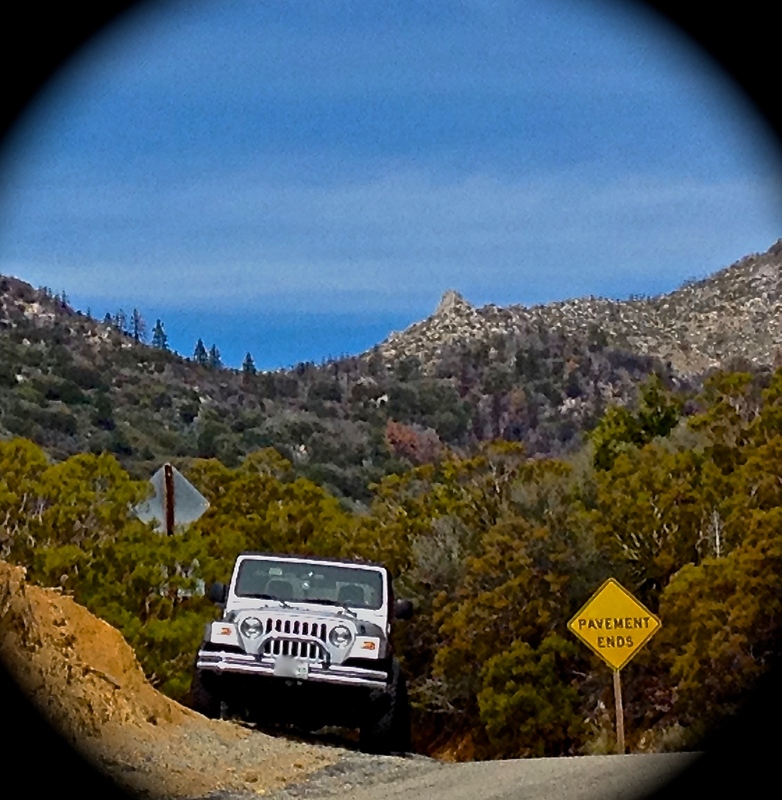 At times, a popular area for jeeps and dirtbikes, the road up to the old mine is a challenge for a good driver in an off-road vehicle. We would only see one vehicle coming down from the mine. The landscape here was so different from the area around Coyote Mountain to the west; that’s one of the things that we love about this desert. 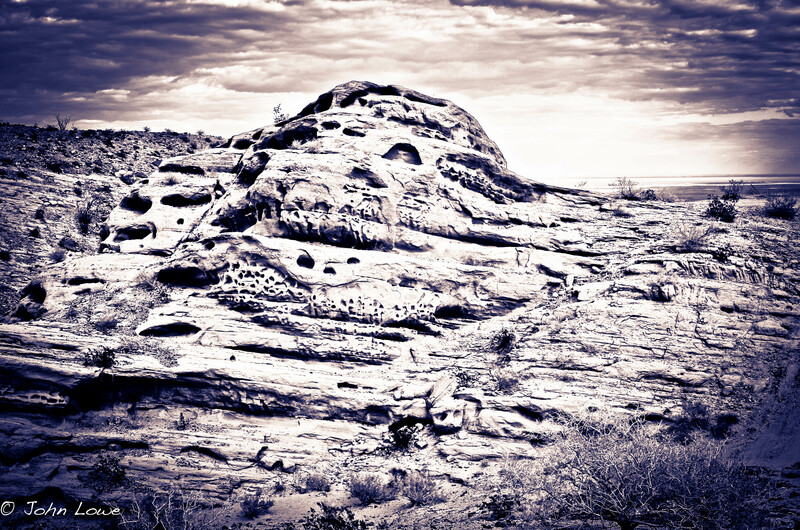 The sandstone cliffs appear to be carved out of the ground by a majestic artist. As the sun shifts and passes in and out of the clouds, the colors constantly change. The contrast of the land with the sky and Salton Sea to the east present a palette for the amateur artist. The Calcite Mine Trail, is an approximate 4 miles round trip. 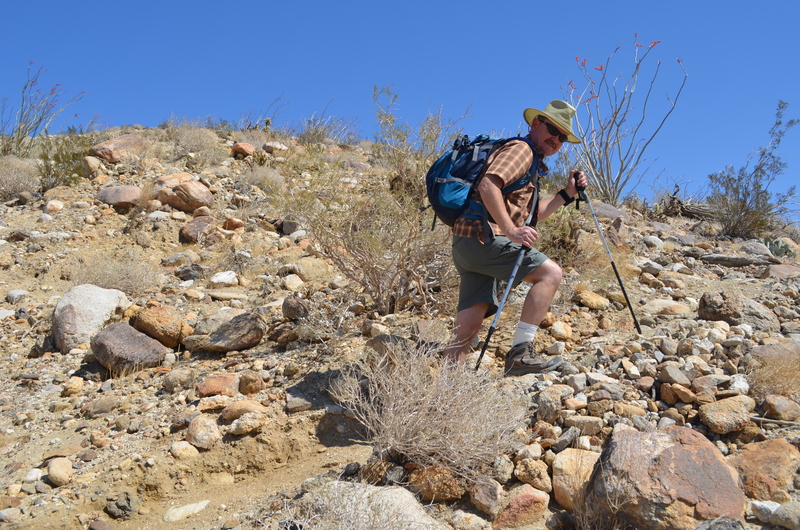 It is an easy-moderate hike up the jeep trail and the elevation gain is around 500 ft. Not much shade here, so hope for a cloudy day, bring lots of water, sunscreen and a nice hat. As we made our way up the rocky road/trail, we scrambled up the side to peer down into one of many slot canyons. Oh yeah, we just gotta check that out on the way down! If you’re thinking that the calcite mine is intact, you will be disappointed. Filled in long ago, there are barely traces that it even existed. There are shards and chunks of calcite, but like most other parks it is illegal to collect souvenirs. An interesting mineral, it was actually used in Norden bombsight manufactured during WWII. It’s quite possible that the bombsight used on the Enola Gay had calcite from this mine. We would have lunch near the old mine marker, on a sandstone outcropping. As is our new tradition, we would have hot tea. 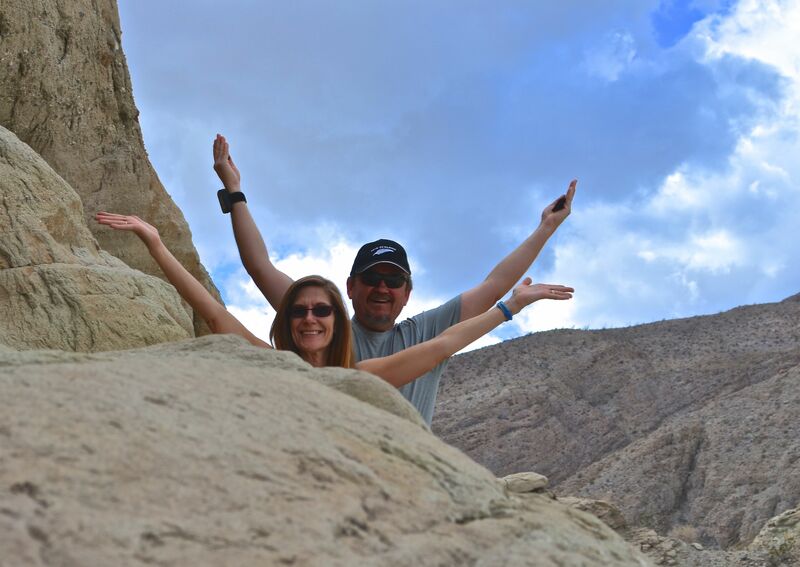 Having fun on the sandstone cliffs. 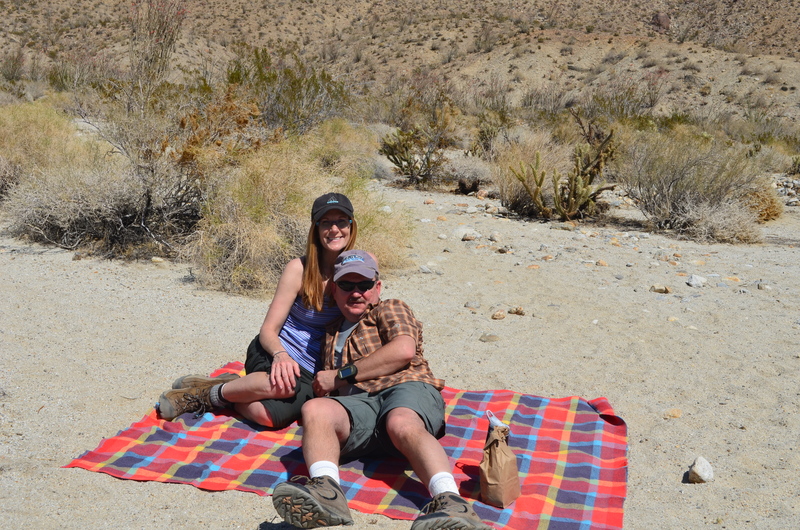 We enjoyed the solitude and the panoramic views from our lunch spot and began our way down to the slot canyon. It was exciting to enter the canyon as the sandstone walls rose to over 75 ft. Mary mentioned that this was not a good place to be during an earthquake. 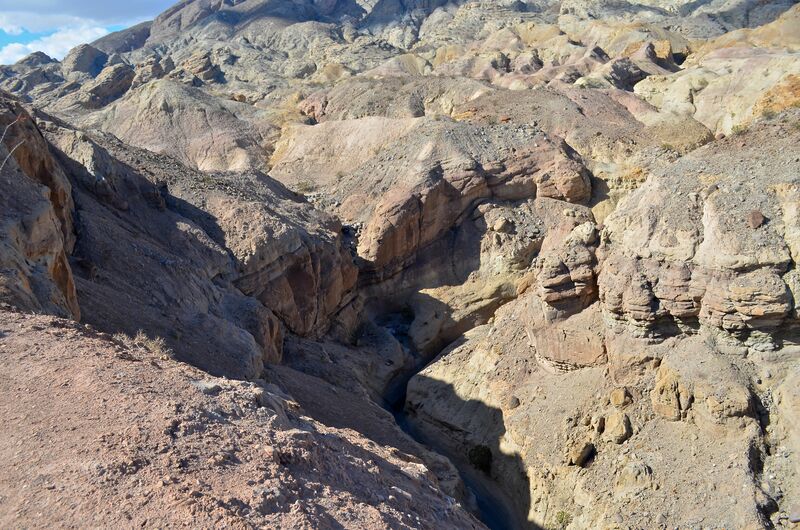 Within a week of hiking this canyon, a 4.5 quake would hit near Anza, about 15-20 miles from here. I checked the skies for signs of rain. A storm to our north could bring flash floods that would make our fate like the dinosaurs of old. 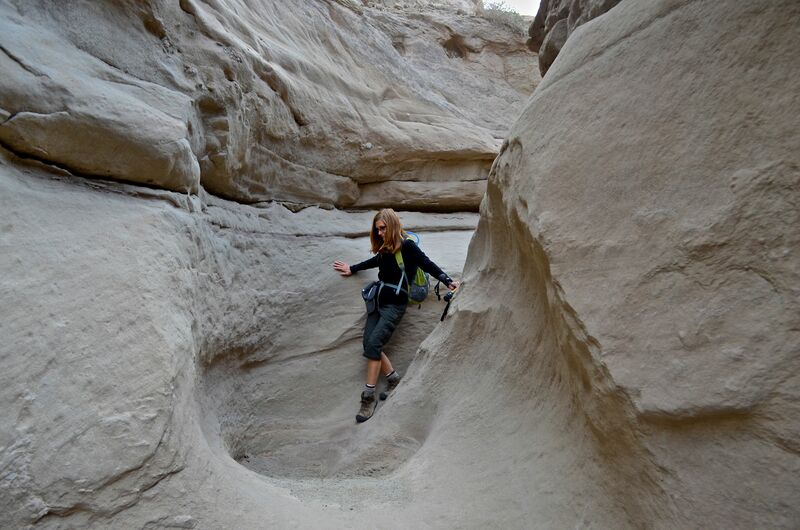 Mary really enjoyed navigating the narrow canyon. We made our way down, the walls closing in and the path as little as several inches wide. It was fun and one of the most unique experiences to date. 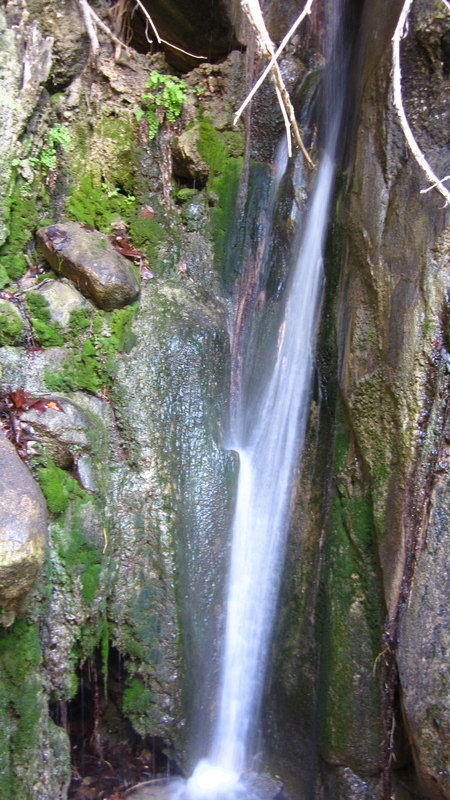 We would stop to examine the cliffs and formations carved from repeated water flows. Sometimes, we would have to jump 5 feet or so to the next level. I was trying not to get my foot stuck. 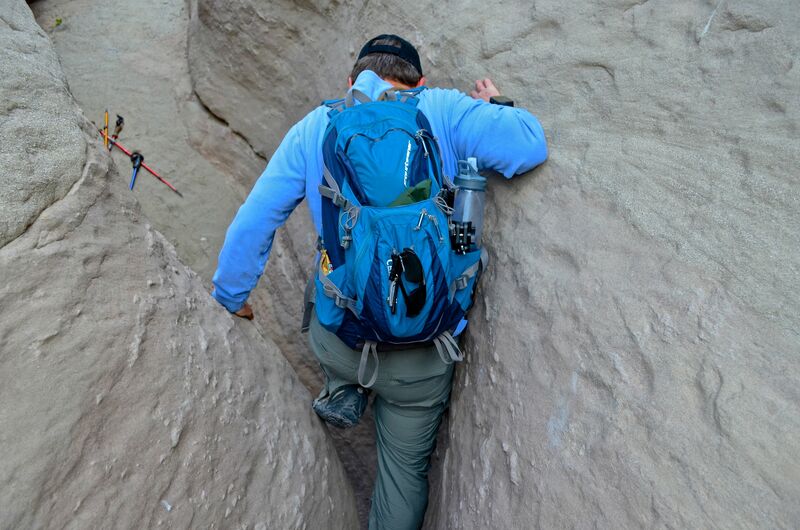 The slot canyons are not for the claustrophobic. Eventually, we emerged from the slot canyon into Palm Wash, one of many that had its’ own ecosystem. Other than birds, we would see mostly insects, beetles and huge colonies of ants. One ant colony was carrying the blossoms from an adjacent bush to their queen. Even in this sparse land, God sees fit for his creatures to survive. We would encounter a few motorcyclists on their way back from exploring the nearby trails. This slot canyon opens up into a wash that goes on for miles. As often is the case, I missed the turnoff if there even was one. My GPS indicated that we were diverging from our original track to the mine. A nearby cell tower was a good reference that indicated we were east of our goal. We cut over a hill and headed west as the sun rapidly sank low in the horizon. We were pushing 10 miles at this point, but the waypoint on my GPS indicated we were getting closer. In my rush this morning, I didn’t print out a local map. Duhh! We were ok though, on day hikes, we tend to carry more than we need and are usually prepared in case we have to spend a night out. The walkabout ended uneventfully and we chalked up another successful day in the wilderness. I encourage you to get out my friends – regardless of where you live. There is so much to see…. Bloggers have various reasons they write. For some, it is to share their thoughts. For others, it is a release or an outlet for the passion that they may have for a particular activity. Many are amateur photographers and enjoy posting their work. This episode is dedicated to a recent overnight camping trip to one of my favorite places and a quirky area of photography that is fun. 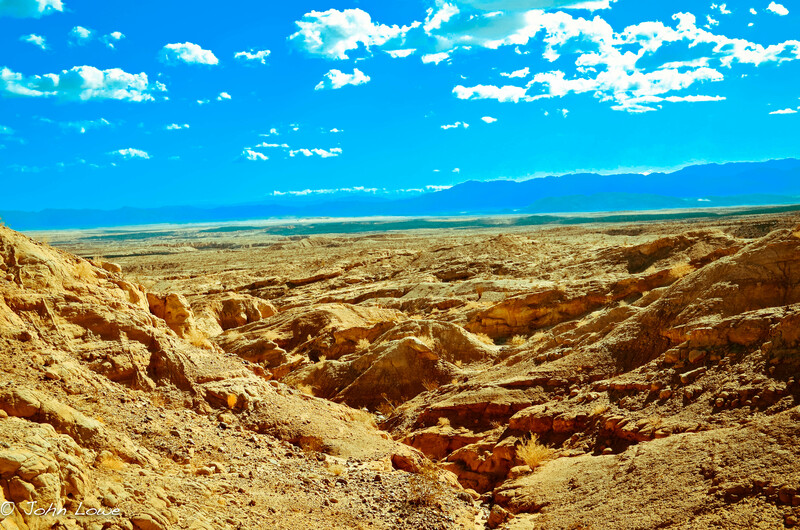 Anza-Borrego State Park is about 75 miles from my home in North County San Diego. From late fall to early spring it provides a variety of activities due to the milder weather. 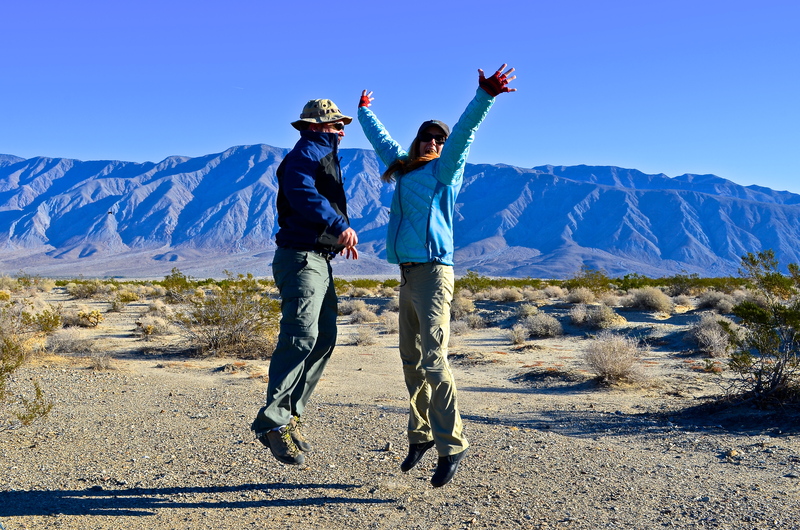 This mid November day found us heading out to an area a few miles east of Borrego Springs to hike and camp. One of the neat things about this state park is the freedom to move about and explore, including free camping. Free? In a state park? Sure, just stay outside the park campground and you can pretty much pitch a tent or park an RV without paying a dime. 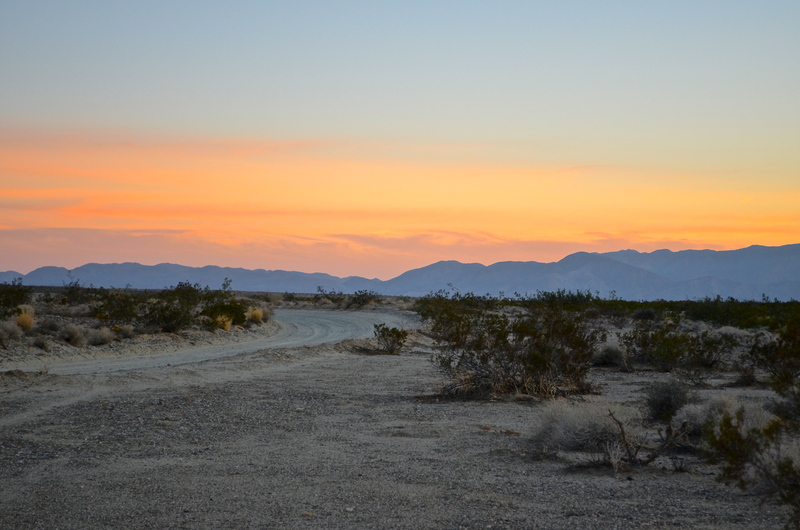 While researching camping in Anza-Borrego on the Internet, I stumbled on a blog that discussed “boondocking”. A strange word, the last I heard anything close were the boondockers – black chukka boots that we had in the Navy. However, boondocking is basically free camping in remote areas or private property – with the owner’s approval. At times, there is probably a fine line between legal camping and trespassing, but I’ll only go where it is legit. So a boondocking we went down Rockhouse Canyon Rd. 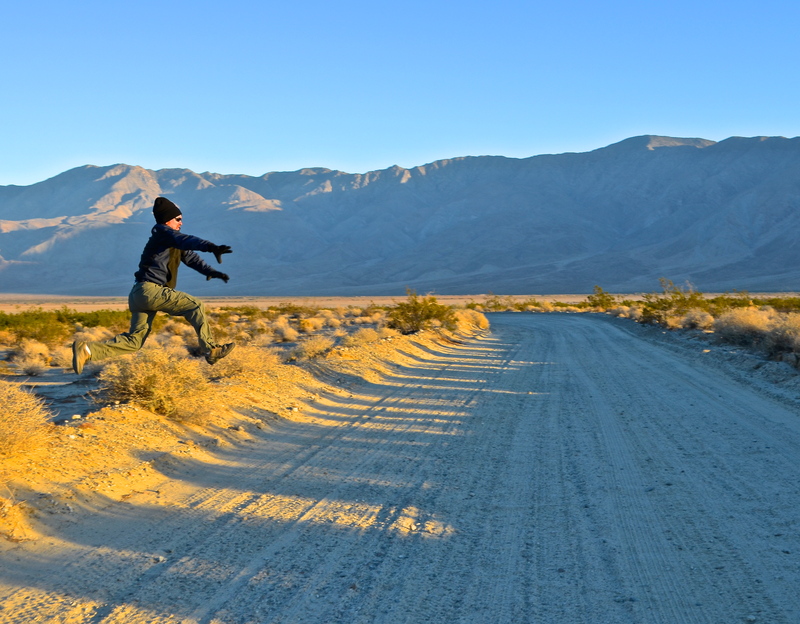 near Clark Dry Lake. 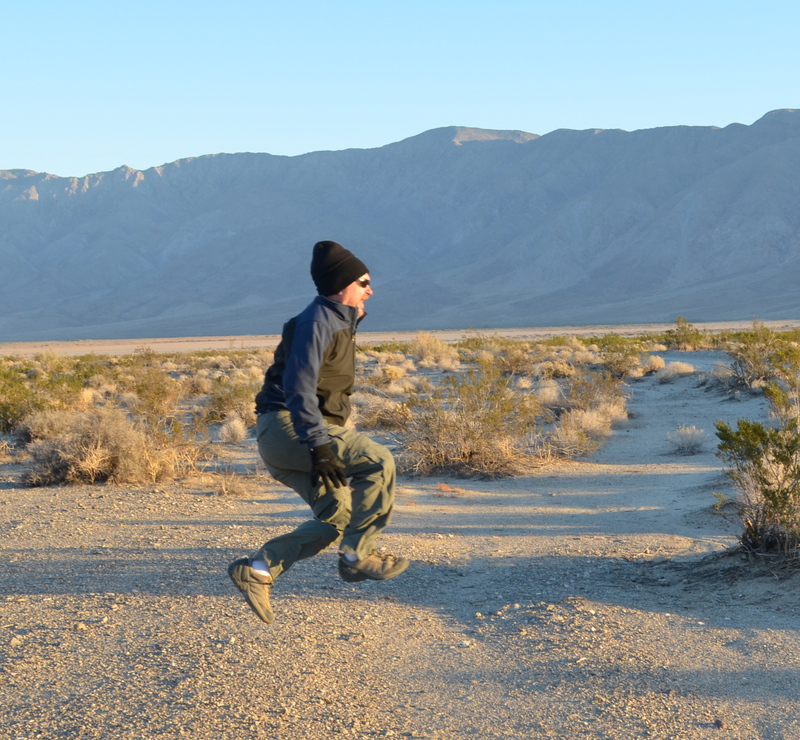 It’s a nice valley located between two mountains – Coyote Mtn to the west and Villager Mtn to the east. 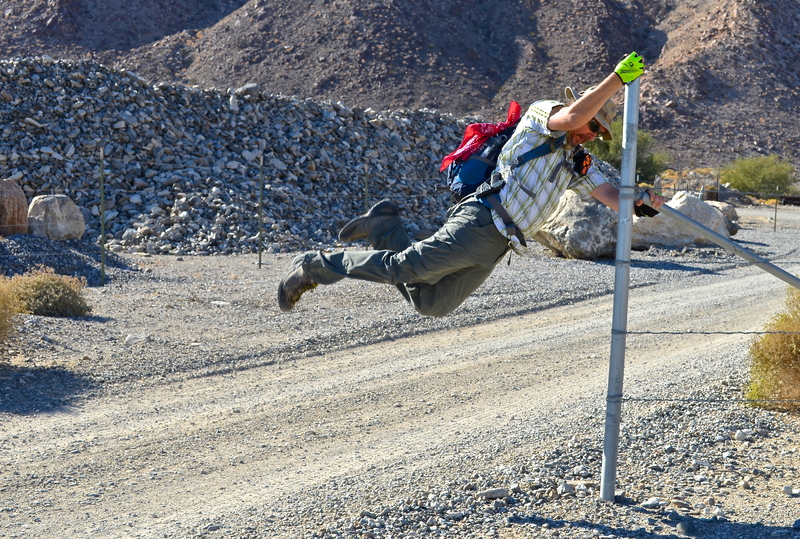 Rockhouse Canyon is a dirt road located approximately 5 miles east of Borrego Springs on SR22. You can usually see a cluster of RV’s near the highway as most don’t venture too far down the sandy road. During the week, you can drive a mile or two and find a secluded campsite. 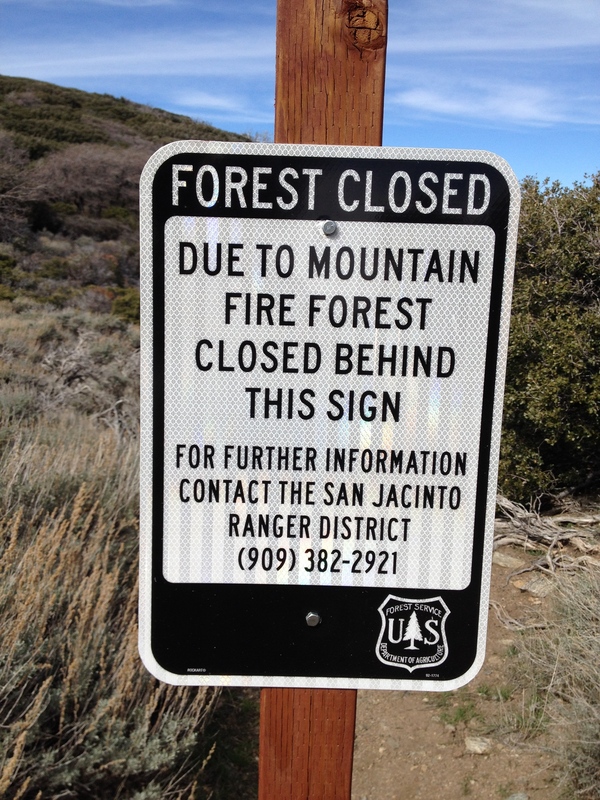 There is one rule in the state park: you must use a metal container for fires. However, we noticed there is an abundance of homemade fire rings throughout this area. We pulled in, looked around and noticed the nearest neighbor was almost a 1/2 mile away. Yes, this will work. 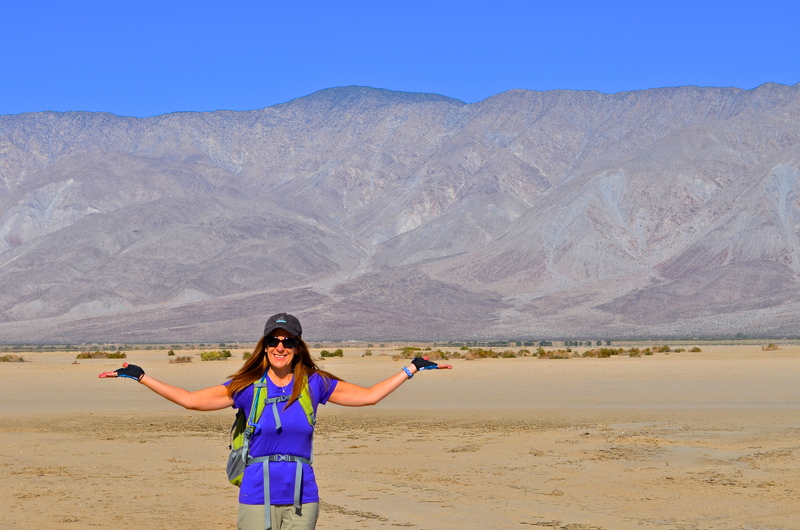 We would stay in the valley and hike north toward Clark Dry Lake on the jeep road. Overall, the road was in good shape this time of year. We ended up walking out on the lake bed, passing Coyote Mtn on the left and came up on a quarry. It was a good opportunity to have fun with some levitation photos. My wife even got into the fun of levitation. 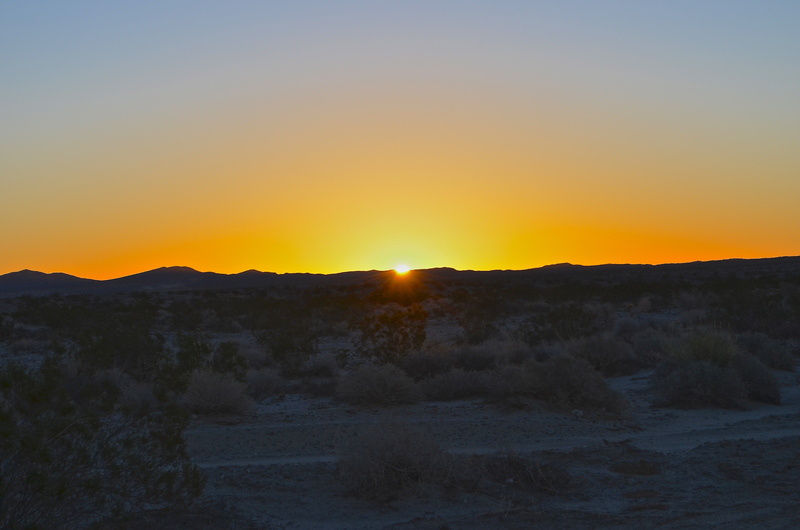 The real visual treat in the desert occurs after the sun sets. You just have to experience it. 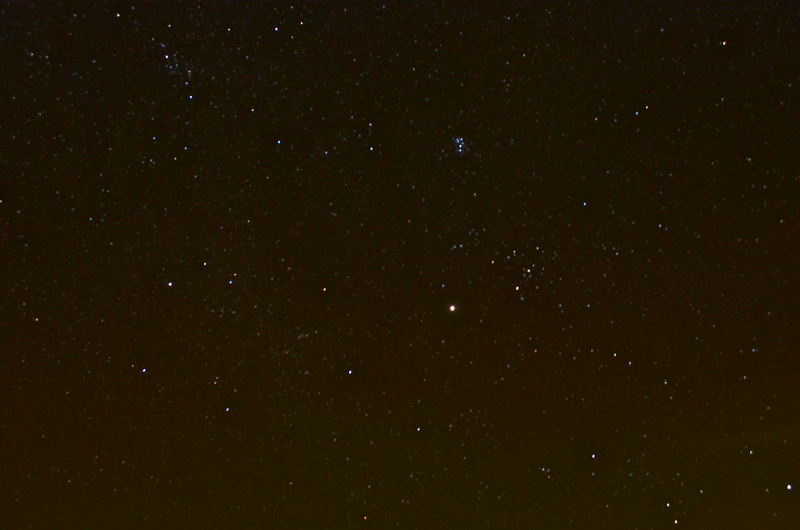 Tonight, it was nearly a new moon and the stars almost outnumbered the grains of sand on the beach. Next time, I must bring a telescope. In my opinion, a campfire is an absolute necessity for a night in the desert and knocked the edge off the rapidly dropping temps. The forecast called for 43 degrees, but we came prepared with several layers of clothes and some 3 season sleeping bags. By the morning, it would drop to 33 degrees. 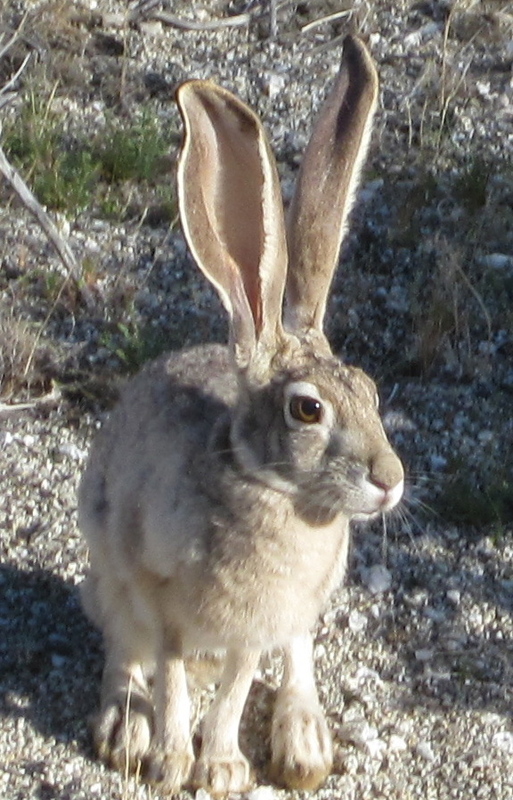 The animals were most active around sunset and we observed many jackrabbits. 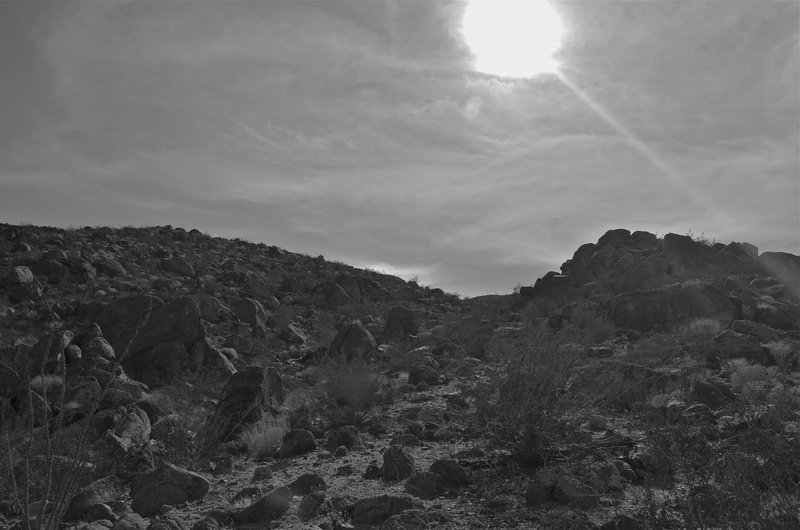 Several desert foxes ventured within 20 ft. of the campsite – curious little creatures with bushy tales. The coyotes began their yelps and would call out from the east and west. Once in the tent, the silence of the desert lulled us into a gradual sleep as I dreamt of the Bighorn Sheep jumping over Coyote Mountain. Huddled in our sleeping bags, the dawn began to faintly illuminate the tent. I scrambled out and encouraged my wife to come out to see the sunrise. The air was dry and cold, but the sky was beginning to blossom with various hues of light. After watching an amazing display, we made our hot chocolate and enjoyed a nice, hot breakfast. My wife’s first car camping experience turned out very well. I think that she might try it again. Hopefully, next time it will be a little warmer at night. 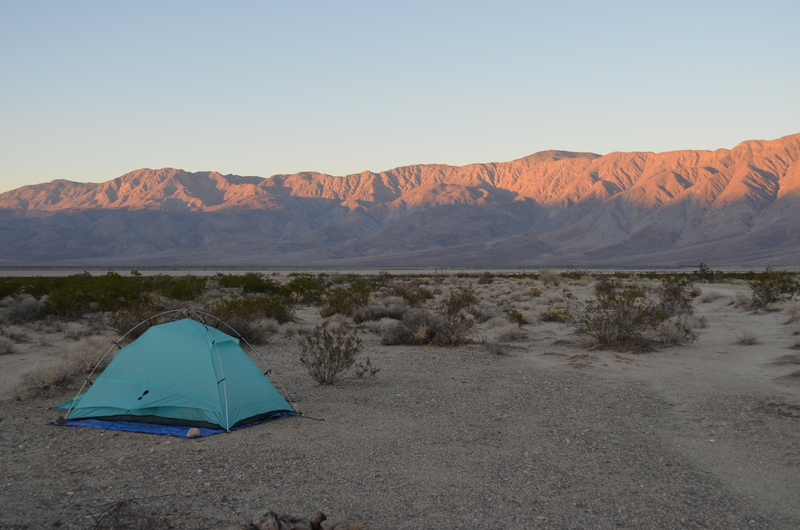 I encourage you to try camping in the desert – it will be a real treat. Parting of the boulders in Alcoholic Pass. 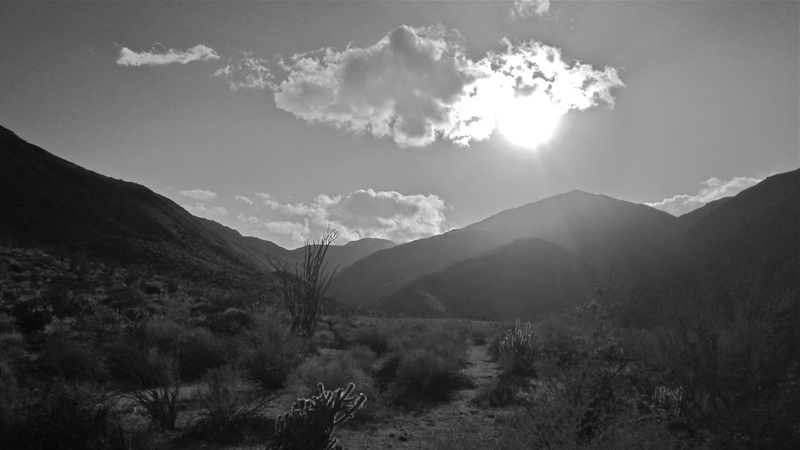 PART I: The Anza-Borrego Desert is an amazing place. I know, to think of the desert as amazing is weird. 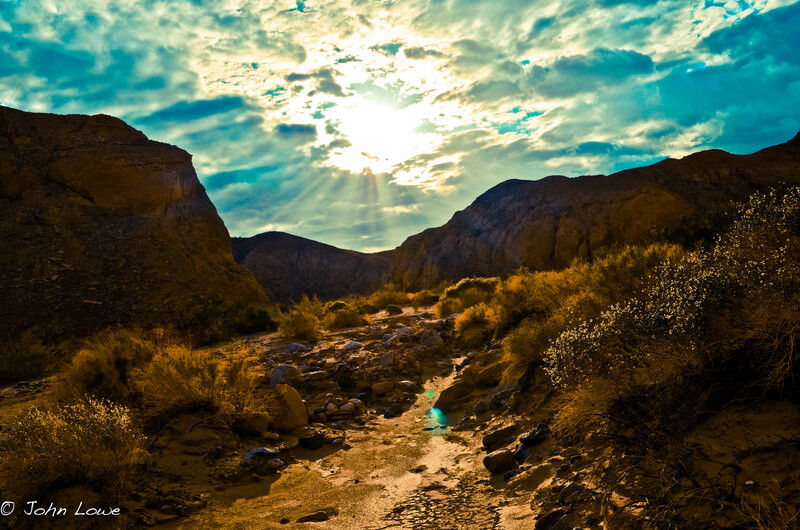 However, this desert in southeastern California is one of the most serene and beautiful places ever. 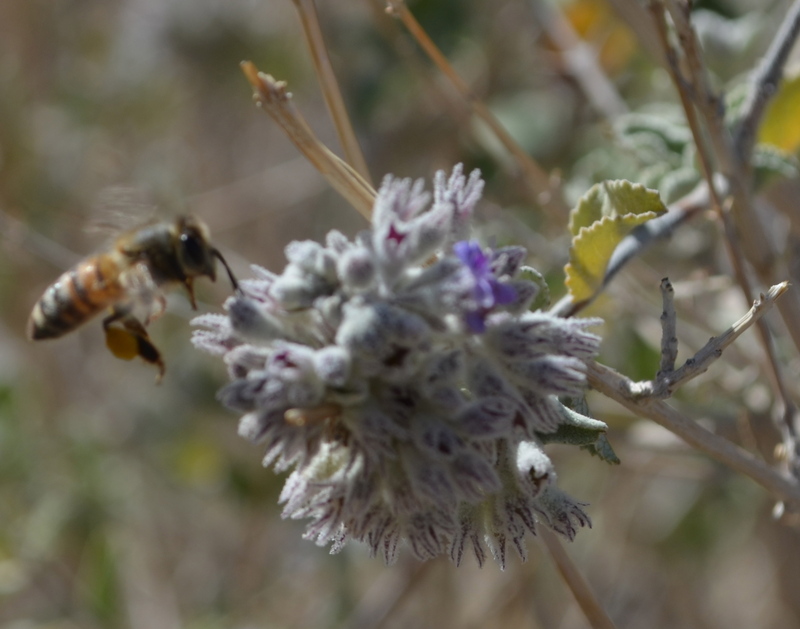 Anza-Borrego is well-known to southern Californians for its’ desert flower blooms in the early spring. It’s also known for the miles of jeep/RV trails and horseback riding paths. Last year, we walked 7 miles down a jeep trail with the stiff desert wind filling our nostrils with the aroma of desert lavender. 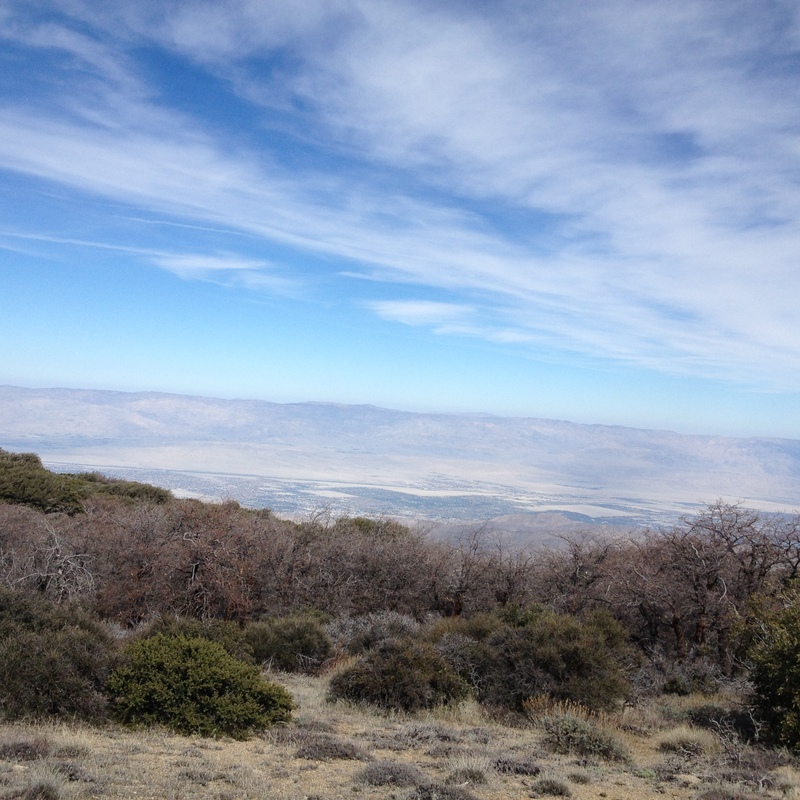 This time, we were hoping to go higher and find some elusive Desert Bighorn Sheep. The intensity of the desert flower blooms in Anza-Borrego depends mainly on the amount of rain. This past winter was one of less than average rainfall, so research on the Internet indicated that it would be a less than spectacular display. 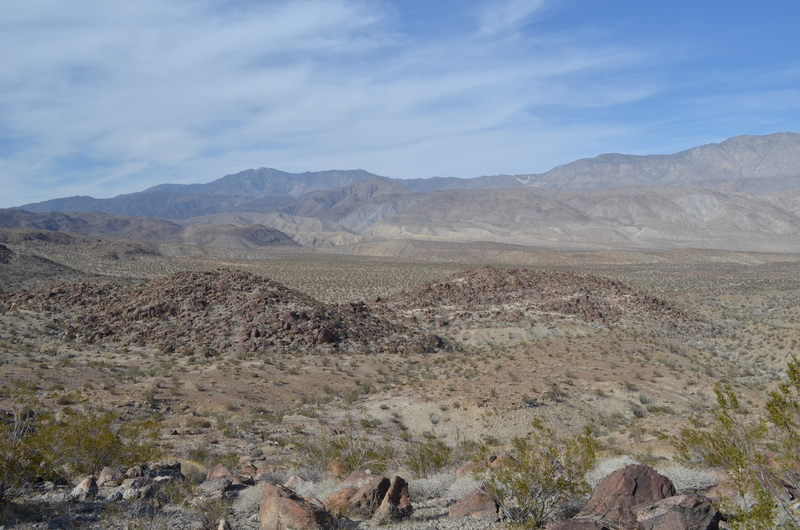 Today’s goal was the Alcoholic Pass Trail, a path that would hopefully take us higher into the Coyote Mts for some views of the desert floor and Santa Rosa Mountains to the north. Arriving just in time for lunch, we spread out the blanket in the sand behind the car. It was almost like the beach except there was no water and lots of desert flora. The weather in the desert is a bit unpredictable. In the early spring, it is fairly mild with few thunderstorms and constant winds. It was a mild 76 degrees. We hit the trail and the incline was steady with plenty of switchbacks and a lot of lizards. The perspective of the desert floor changed constantly as we went up. The barrel and fishhook cacti was colorful today. We broke out into an opening where we signed the trail register. 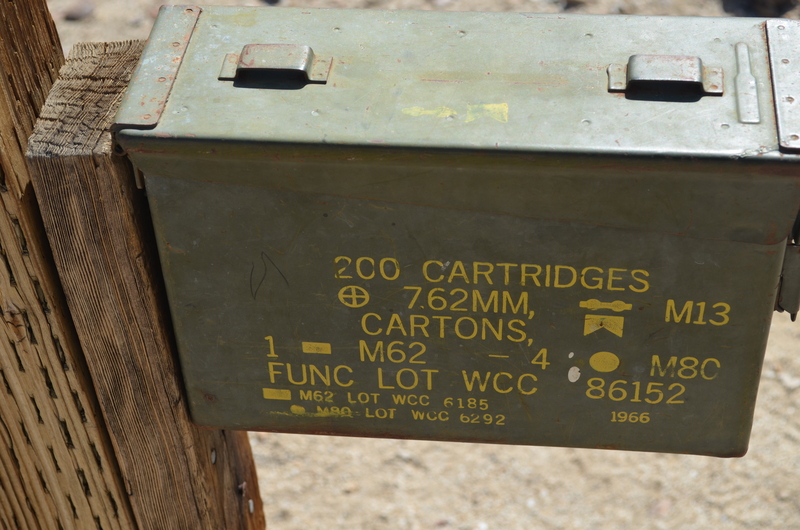 It was cool to write our thoughts and place them back inside a Vietnam era 7.62mm ammo can which kept the trail register out of the elements. Up ahead, we could see the Santa Rosa Mountains as we did some light bouldering and dropped down into the canyon. The vastness and beauty of the surrounding desert was awesome. The trail ended at this point in a desert wash. I suggested that we climb an adjacent hill, and we picked our way to the top around various sized rocks and boulders. The terrain was so rugged that we had only walked 2 miles in a couple of hours. Normally, we hike twice as far. As we looked around, we decided to head back west toward a high ridge. 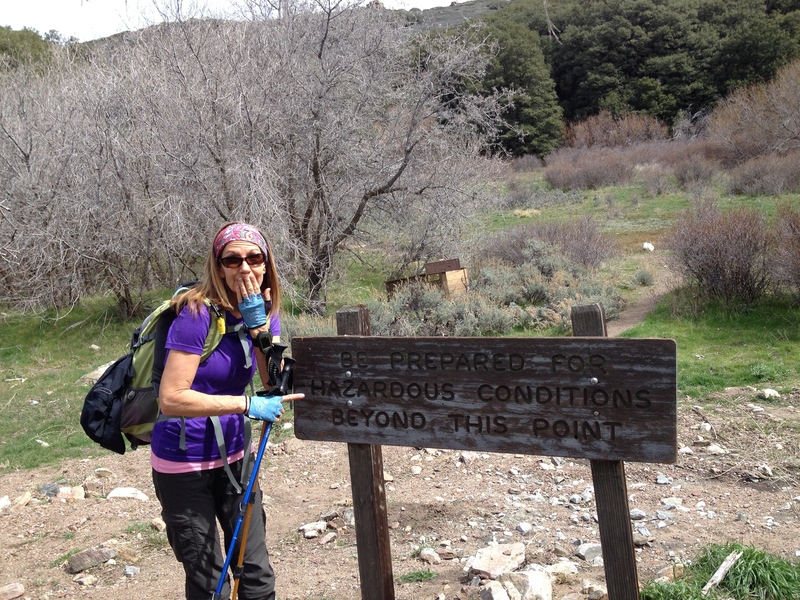 Going off trail is usually an adventure and is where this blog gets interesting. As we looked to the west, we picked out a reference and started making our way. The scrambling over rocks was challenging, but the grade was not too steep. Making our way through a few ravines, I commented about not seeing any footprints or horseshoe tracks. Mary casually mentioned that there weren’t any footprints because we were on rock. Sometimes, I just say goofy things. The late afternoon heat was apparent, but we each had 3 liters of water and were well hydrated. We stopped frequently to catch our breath as climbing over the boulders on this summit really helped us burn some calories. We finally made our way to a high ridge and the terrain flattened out. I showed Mary a beavertail cactus and mentioned how soft the pads were – kinda like leather. I had touched one earlier in the day, and thought that it was weird that a cactus didn’t have needles. Mary, who trusts me almost implicitly, gently stroked the cactus and agreed that it was “velvety”. We continued up the ridge. I was in the lead and within a few minutes, she said, “Oww, I have something in my fingers”. Looking at her hand, I was surprised to see about a dozen or more tiny cactus spines lodged in her fingers. I tried to get out as many as possible, but the plastic tweezers in the 1st aid kit, were too big. I felt bad for her and learned a valuable lesson – don’t pet the cactus. Actually, Mary probably learned a valuable lesson too-don’t believe everything John says. After reaching the ridge, we started to pick our way down the mountain. 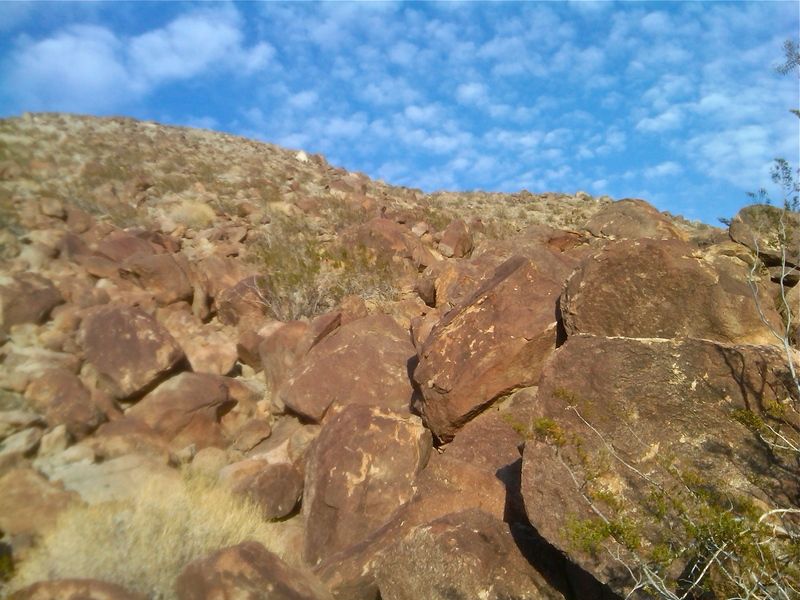 No trail here, just an escarpment of boulders and scree (talus) that moved beneath our feet. 900 feet below, the desert floor teased us. There was no path here, and the grade varied between 30-100%. A 100% grade is equivalent to about a 45deg angle. Covered with loose rock, it was not fun or safe, so I tried to avoid the extreme grades on the way down. So, the off trail adventure turned into a “hiking down the talus slope” adventure. My wife, who I am now convinced is one of the toughest girls you will ever meet, extended her hiking poles and followed me down the mountain. We were doing fairly well, and the altimeter on my GPS indicated we had dropped down about 500 ft. but picking the path down was difficult. Oh, we did see evidence of the Bighorn Sheep. Lots of “sheep dip” on cliffs and under boulders, but no sheep. I remember our conversation going down as we joked about how crazy it was for two fifty+ year olds to be doing this and how the sheep were probably laughing at the bipeds slowly making their way down. Then it happened. I remember hearing rocks and gravel tumbling down behind me and by the time I turned around, she was on the ground with a dazed look on her face. Mary had slipped and rolled down the hill about 10 feet. Her hat and poles were behind her and she asked if her head was bleeding. She told me that other than bumping her head, she felt a bit lightheaded. I did a quick assessment to ensure she wasn’t seriously injured and then she told me something that we will laugh about for years to come. In a calm and monotone voice, she said “There’s a rock on my arm”. I glanced over and yes, there was a 5 lb. slab of granite on her forearm. Hoping that it wasn’t attached to her arm, I lifted it off and tossed it aside. We spent the next 10 minutes or so ensuring that she was ok, prayed together and asked the Lord to give us a safe journey and we continued down. Other than taking it a bit slower, she never complained or whined about anything. She was a bit upset about the tear in her pants, but I assured her that REI would take anything back. NEXT: Hummingbird, stars and Hedwig.